This page details the requirements that are specific to the Passive Content Curation in addition to those expressed for the Reference demonstration environment (link). Repository: One dedicated machine for the repository importer, the analysis modules for the Passive Content Curation, and the website used to present the captured URLs. The Python code for the supervisor is the one provided in the mPlane protocol RI repository, i.e., scripts/mpsup. It receives the specification from the reasoner and forwards them to the other mPlane components. tstatrepository.py integrates the capabilities of communicating with Tstat and the interface to the query the analysis module. reasoner is the Python script for the reasoner. It starts the Passive Content Curation demo by activating the streaming exporter of HTTP logs generated by Tstat, and periodically queries the tstatrepository to obtain the list of the most popular content observed in a given period. Once started, the mPlane proxy interface for Tstat should start exporting data (HTTP logs) to the repository interface. This will filter the HTTP requests to extract those corresponding to actual clicks generated by users. The analsyis modules built on top of the streaming importer will also classify the URLs depending on the kind of content the point to (e.g., videos or news). The demo will demonstrate the feasibility of the passive content curation approach and its viability using the mPlane protocol. For the sake of showcasing, the URLs extracted by the WeBrowse modules will be presented in a website, similar to the one available in Polito deployment, http://webrowse.polito.it (see the picture below). 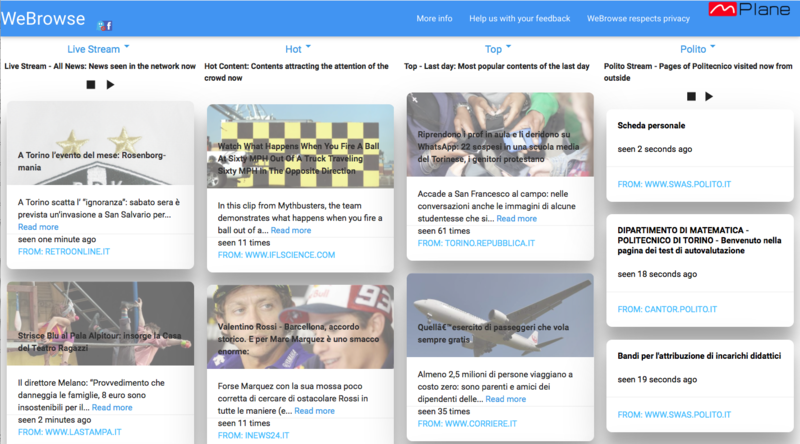 Notice that popular content exhibit as expected a strong locality bias, with italian newspages (having no english version) consistently showing up in the interface. 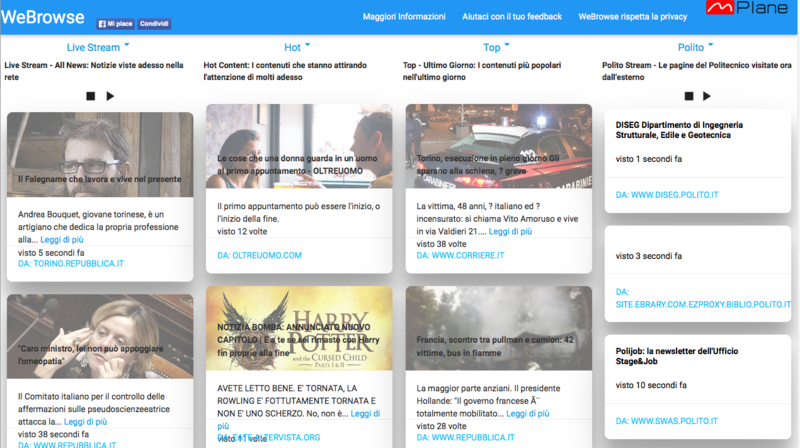 During the demo we will emulate the behaviour of a user in the network by generating automatic visits to a list of news webpages. These will hence appear in the front-page of WeBrowse.